Does my patient have Ebola? Are you serious ?!?! 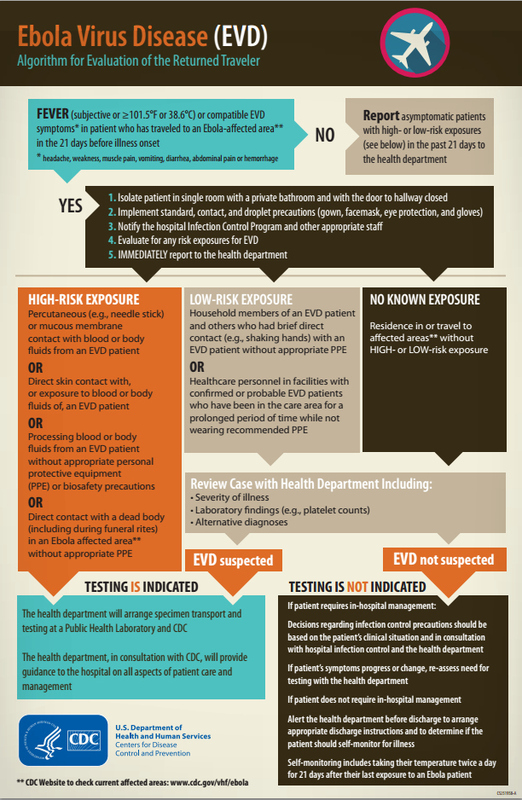 So you ask: Why should emergency physicians in the USA begin thinking about Ebola? A1: In this global age, people don’t stay put. Emergency departments (EDs) around the country serve an important role during epidemic and pandemic infection. We are called on to both identify suspected/potential cases early and to treat appropriately – including preventing spread of disease through quarantine and isolation procedures. In October and November 2001, EDs across the country prepared for Anthrax, which 2 months previous would have seemed ludicrous. In fact, at least 7 of the first 10 cases of pulmonary anthrax presented through the ED. (http://wwwnc.cdc.gov/eid/article/7/6/01-0604_article) In the fall and winter of 2010, the spread of H1N1 pandemic influenza was tracked and modeled in part due to ED based surveillance. This year we need to prepare by educating ourselves about measles, MERS-CoV, and unfortunately: Ebola. If you ask any savvy senior medical student rotating through the ED, “What are the symptoms of early Ebola?” I’m betting they would correctly guess: like most infections, Influenza like illness. Fever, malaise, headache, and myalgias are all likely. These symptoms generally begin in the second week after exposure (range 2-21 days). Manifest critical illness develops when the virus causes disseminated intravascular coagulation (DIC) which later produces a consumptive coagulopathy and hemorrhage . . . pretty much everywhere. Ebola hemorrhagic fever is characterized by a palpable purpuric rash (bleeding into the skin) as well as other internal and external hemorrhage. Patients often bleed from the eyes, ears, gums, and nose as well as the GI tract. Along with the bleeding comes multiorgan failure (liver, kidney etc). Death generally occurs in the second week after symptoms start. Treatment of patients with possible Ebola relies on supportive care and isolation. The virus is spread by direct contact with infected material, so strict contact isolation is a must. At Mayo Clinic we are to utilize “Modified droplet” isolation for suspected Ebola cases. Unfortunately, antiviral medications have so far not been effective in treating Ebola. IV fluid management and maintaining oxygenation are the first steps in stabilization and treatment. DIC and coagulopathies require repletion of coagulation factors and/or platelets as needed. I would avoid any anticoagulation given that bleeding is the next step. Hemorrhage should be managed with volume replacement and transfusion as needed (don’t forget the plasma/coagulopathy correction). Involve your infectious disease colleagues early since they will be able initiate testing (guessing that may not be in my common orderset! ), and offer recommendations on management of close contacts and complications of the clinical care.